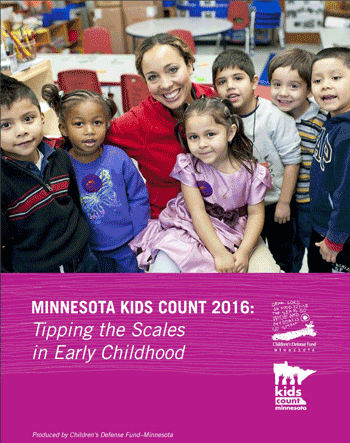 Every year, Children's Defense Fund-Minnesota (CDF-MN) publishes a KIDS COUNT Data Book. The Data Book provides state data based on a variety of indicators that show the well-being of Minnesota's children and families. The data serve as benchmarks of child well-being for policymakers and citizens and help to enrich local, state and national discussions concerning ways to secure better futures for all children. CDF-MN organizes an annual KIDS COUNT Coffee Tour around the release of the book to provide policymakers and citizens from around the state with the opportunity to learn about the data and engage on issues of child well-being. This week, SMIF hosted CDF-MN and many early childhood care professionals to learn about key 2016 data trends. This year's report, "Tipping the Scales in Early Childhood," focuses on early childhood and features research on the importance of early childhood development, data on the status of Minnesota's youngest citizens, and programs and policies that support success in early childhood and throughout adulthood. A lot of the data is disaggregated by race and ethnicity. While Minnesota has ranked #1 in the nation for childhood well-being, when the data is examined by race and ethnicity, it is evident that children of color and American Indian children in Minnesota experience greater barriers to success. Read more. Nearly 1 in 3 kids in Minnesota are children of color, and this is expected to keep rising; nationally, over 50 percent of babies born are children of color. It's important to take a "two-generation approach," focusing on both the children themselves, as well as the well-being and education of their caregivers. 55 percent of kids ages 3 or 4 are not in school in Minnesota. This is 61 percent for black and American Indian children and 60 percent for Hispanic or Latino. There were so many other useful data insights - take a look at the full KIDS COUNT Data Book!